When people see a hoverboard, they immediately relate it to celebrities like Wiz Khalifa and Justin Bieber. They see is an image of a person atop the machine darting on the pavement. There is no doubt the hoverboard is likely to last, but this technology isn’t limited to scooting. You can use the device in several other interesting ways depending on your creativity. Consider the following fun ways of using your hoverboard. Are you tired of the balancing acts and hair-raising maneuvers? Imagine using your hoverboard as a cart attachment that you can ride in the most comfortable position. What started as a simple idea has now grown rapidly to the point that cart accessories are over the market now. There is probably no safer way of riding the hoverboard than this. The setting ensures stability and control because instances of falling over are eliminated. Attach your hoverboard to the cart and you have the world at your feet. You just need to master this new design, just as you did with the hoverboard. Most of the carts are able to work on a wide range of surfaces including packed sand and gravel. Siren Design Studios have designed a coffee table that floats in air. The floating abilities of this piece of furniture remind of Back to the Future II and the machine that Marty McFly rode. This is an interesting piece of technology but the table concept we are referring to is very different. Who doesn’t want a snack? In America, nearly everyone is snacking daily, according to a report from Mintel Group Ltd. The hoverboard is light and mostly flat on the ends, yet snack lovers may have missed to maximize on this all along. Place the hoverboard on one side so it sits on one wheel. Place the snacks on the balanced device and snack away. Since these products mostly weigh in at 25 pounds and thereabouts, this is definitely something every user should try. To me, the HoverCart design is the most fascinating use of affordable hoverboards. This is a very easy conversion, whereby you add a chair to the hoverboard using a frame. While the original idea of this design was to ride while sitting, a whole range of applications has emerged. You can tow just any lightweight cargo. 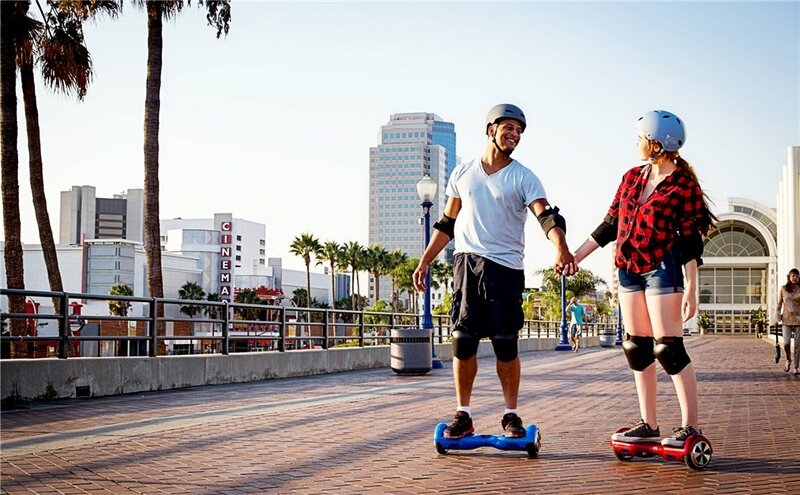 While the top speed of your hoverboard can be a little bit uncontrollable while standing, this setting allows you to scoot at those 15mph speeds. Ardent hoverboard lovers must have seen the videos of the popular Australian Jackson O’Doherty as he does all forms of tasks with the hoverboard. For me, the fact that you could use the machine for transportation is most fascinating. If your local authority allows it, you could try using your hoverboard to push the shopping cart too. It is a very fun way of moving items across the floor. While this idea seems farfetched, it could be the future of hoverboards. The hoverboard may be subject to strict control now, but if you ever have one, do not hold back. The hoverboard’s simple design and lightweight nature allows you to not only throw it the carrying bag, but also use your ingenuity freely. You do not have to stand up to have fun. The uses we have suggested here do little if any harm to the best affordable hoverboards. Why not provide an extra chair or cart away the shopping? Here are some suggestions for you just in case you are yet to own a good hoverboard. "Hoverboard 8"" All Terrian Hummer Self Balancing Wheel Electric Scooter - Gray"